This event coincides with FIFA World Clubs Cup 12-months prior to FIFA World [nations] Cup. Tournament organizers will seek match tickets as part of the tournament package for participating 060 players. The 2017 International Super Veterans 5-a-side World Cup Football Tournament will be held at Swansea University, Wales. 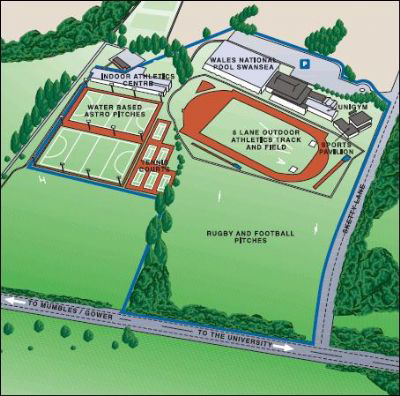 All games (065+ & 055+) will be played on the top pitch at The International Sports Village playing fields, Sketty Lane, Swansea, SA2 8QB http://www.swansea.ac.uk/sport/sports-village/track/ – excellent facilities for players, families and spectators. Marriott Hotel Waterfront Swansea Bay Marina (approx 98 pounds per double room per night including breakfast or 79 pounds without breakfast; Single room with breakfast is 89 pounds. Teams/players can reserve a room using the following link: Book your group rate for Veterans World Cup and Symposium. Alternatively, you can call reservations and book over the phone using the code A62. Please note, April 10th deadline for these special World Cup group rate room prices. 2017 Swansea University Veterans Host Facilities/Venue/Organizers: Neal Evans/Jim Edwards/Nils von Sicard, and Hedley Austin.